Our automated Net Promoter Score® surveys bring you a continual stream of feedback from web and mobile apps and via email. You can send surveys inside your website, mobile app, and straight to user inboxes, it's up to you. You can customise the text, language, and appearance, and everything is sent automatically according to your recurring schedule. SatisMeter integrates with over 20 apps you can integrate. Spend less time juggling tabs and more time focusing on meaningful work. Bring in as many team members as can benefit from your customer feedback. Send e-mail digests of your score and comments daily, weekly, or monthly. All user feedback then goes live into your SatisMeter dashboard. 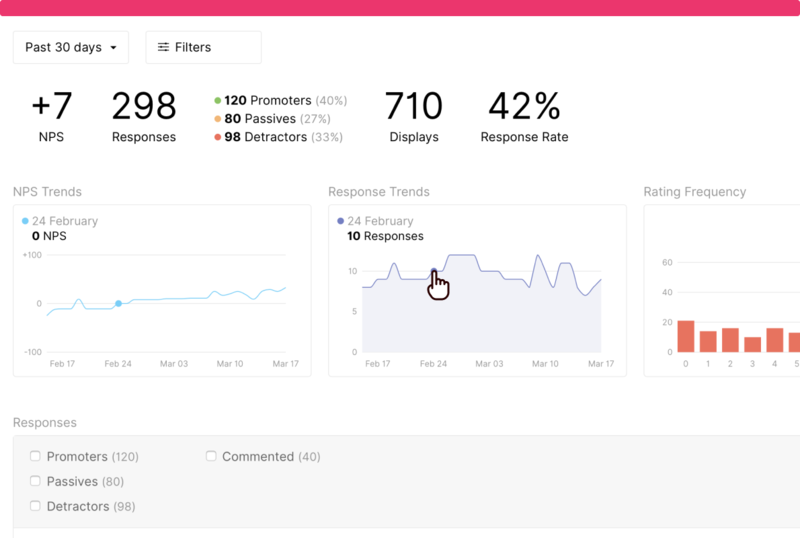 Here you can look at your overall NPS scores, written feedback, user profiles, and stats such as response rates.